At 200 poems, Eating the Honey of Words far outstrips in size and scope Robert Bly’s earlier Selected Poems (1986), drawing extensively on the subsequent collections Meditations on the Insatiable Soul and Morning Poems. Eating the Honey of Words contains at least 30 poems, both old and new, never before published in one of Bly’s major volumes. Add to these the more or less familiar poems now retitled and/or radically revised, and there are many discoveries awaiting even those deeply familiar with Bly’s opus. For purposes of this discussion, I’ll examine Eating the Honey of Words primarily by way of these new or drastically reworked poems, rather than recapitulate the merits of more stable favorites. One of the most striking aspects of this book is the clear sense of purpose with which Bly states lifelong preoccupations in his earliest, least-known efforts. Take for example the fierce, haunting and wholly realized "A Poem for the Drunkard President." In this formative poem we can glimpse, already highly developed, Bly’s quasi-surrealistic collaging of historical images, a technique which found its fullest expression in the 1968 National Book Award winner The Light Around the Body:Little Crow died with skunk-fur bands on his wrists. Taunted the Algonquins while tied to the stake. Others died on high scaffolds in Texas. . . .
End in ashes. The kept life is the lost life. It is still true. What moves us in our tents? The spectacle of Grant, lying drunk, in the rain. With the notable exception of Sleepers Joining Hands (1973), represented here only by a newly pruned version of the long anti-war poem, "The Teeth Mother Naked at Last," Eating the Honey of Words amply highlights each period of Bly’s poetry: Sufi-inspired prose poems of This Body Is Made of Camphor and Gopherwood (inexplicably excluded from the first Selected Poems); poems anatomizing the wounds inflicted and sustained by fathers and sons in The Man in the Black Coat Turns; the imagistically inventive lyrics of Loving a Woman in Two World; emotionally stark poems grappling with Bly’s father’s old age and death in Meditations on the Insatiable Soul; and the serious play of the Morning Poems. Some readers may prefer, as I do, the original, less explanatory version, believing with Coleridge that poetry is best when it is generally though not perfectly understood. That way! There was no rope! I’ve been talking into the ear of a donkey. Of his ears. . . . 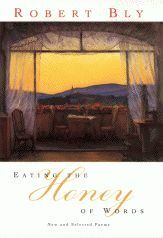 Eating the Honey of Words vividly demonstrates that Bly has made a career of refusing to repeat himself, of upsetting expectations, of taking the road "less travelled by," and of rejecting the conventional and the predictable. Navigating this rich and varied collection, one must admire the consistency with which Bly has remained faithful to spiritual and psychological depth in his poetry. He has proven one of our most durable, surprising, and hard-working poets, and the poems in Eating the Honey of Words constitute the vital harvest of his labors. Anyone wishing to experience the strongest and deepest currents of contemporary American poetry will need to know them.